In case you a having a knee problem, in most situations it will be helpful for you to have an MRI scan of the knee - to make a diagnosis or to support the diagnosis or to exclude other reasons for your problem. MRI scans are really good for seeing meniscus tears, anterior cruciate ligament (ACL) tears and other ligament tears. The price has also declined in the past years and today it is close to 400 euro in Denmark. If your main problem is knee pain, I believe you should in most circumstances have an MRI scan of the knee and you should not have an arthroscopy without the MRI. What is an MRI scan of the knee? MRI scan is a magnetic resonance scan and by having a different magnetic field gradients it can generate images of the knee. Both open and closed MRI scanners exist and as far as I know, the quality from the closed ones is always better. You are supposed to lie supine, and claustrophobia is seldom a problem since your head is out site the machine. 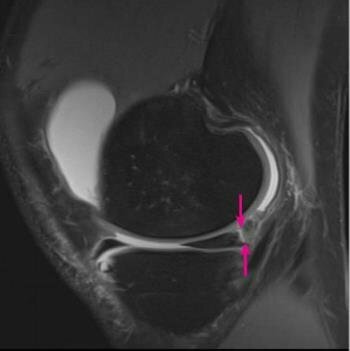 How precise is an MRI scan of the knee? In most situations it is very precise, however there is a number of exceptions. I will try to explain some of those here and what you need to be aware of. First of all an MRI of the knee not a answer book. A good clinical examination, in combination with your history about how the problem started and what type of pain or problem you might have, can been even more precise. Some things cannot be found by either a clinical examination or by an MRI scan and you may need to undergo an arthroscopy of your knee. One of the problems with MRI scans is that the result relies on who is looking at the pictures. Normally the radiologist very good, but they may overlook things and some things might be so special that they even do not even know about it. Sometimes the radiologist has not received the appropriate information from the orthopaedic surgeon that is actually needed to look for a specific problem. The radiologist sends his report to the orthopaedic surgeon. Some orthopaedic surgeosn only look at this report and do actually look at the MRI scan pictures themselves. If they do, they may not know precisely what to look for if it is something rare. The main reason why I write this is not to scare you, but to make you aware that if you are in a situation with continuous pain and you have been told that the MRI is absolutely normal, you might need a second opinion. 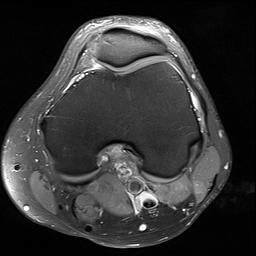 What is typically overlooked by an MRI scan of the knee? I believe that one of the most common reasons to have anterior knee pain, and where also the findings seems to be normal, might be a synovial plica, since this structure can be difficult to evaluate on an MRI. 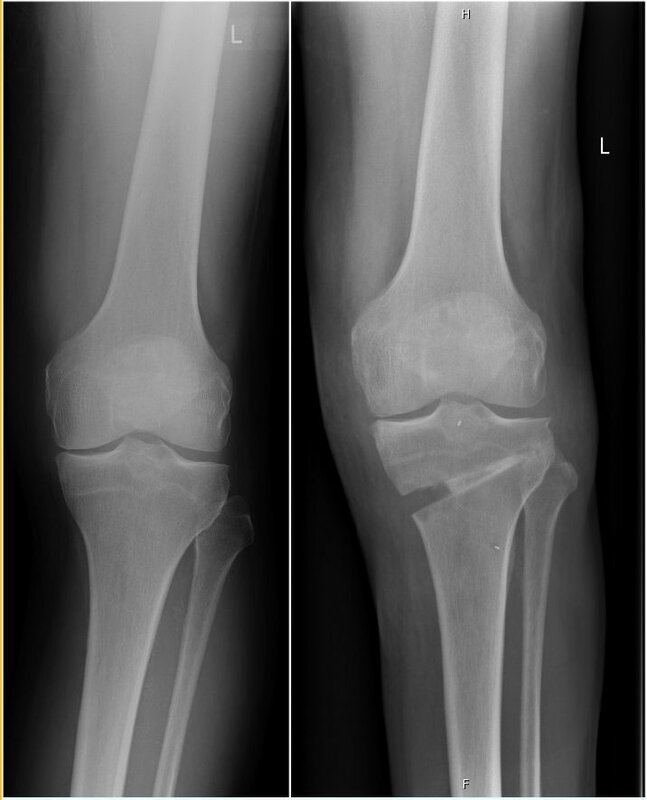 Also trochlear dysplasia is often overlooked as well as patella alta. So the reason for this might be that the radiologist and/or the orthopaedic surgeon do not know how to precisely measure this. At least in Denmark some departments have cancelled the axial view, in order to save time and money. 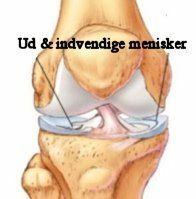 Nevertheless the axial view is the most important view in respect to kneecap instability and anterior knee pain, since this is where the trochlear dysplasia is noticed and the lateral trochlea inclination angle, the trochlear asymmetry and the TT-TG or TT-PCL is measured. So if those measurements are not mentioned and you are dealing with kneecap problems, ask the orthopaedic surgeon about those and if he does not know how to measure, perhaps you should ask for another orthopaedic opinion. 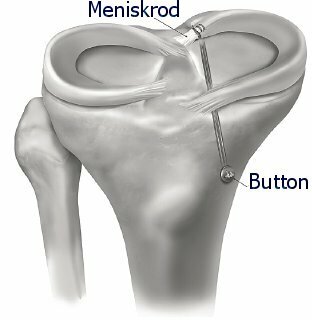 If a meniscus tear is suspected you can be 90% or more sure that the MRI will reveal this tear. However in some situations you can be unlucky that the tear is localised just between two MRI slices and therefore not visible. You might also have what is called a meniscus ramp lesion, that means that the meniscus is torn from the capsule in the rear part of the knee and is frequently associated with anterior cruciate ligament (ACL) injuries. The meniscus ramp lesions can be difficult to see both on MRI and during arthroscopy and are often overlooked. 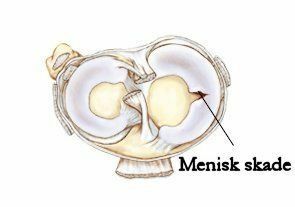 Also meniscus root tears might be overlooked on the MRI scan and "just" called a radial meniscus tear; however this type of tear can be very detrimental to the knee and in most cases surgery is indicated and that means the tear needs to be fixed or cut away. 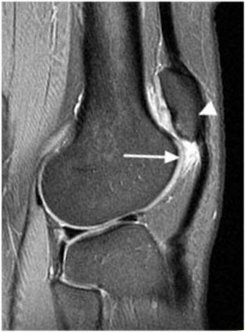 In the figure on the left you see the knee from the side and there is a meniscus ramp lesion; however it is rather seldom the lesion is so clearly seen. Often such a lesion can be overlooked based on a little scar that covers the lesion, and this does also apply during the arthroscopy, and therefore careful exploration might be necessary. Meniscus root tear before and after fixation. 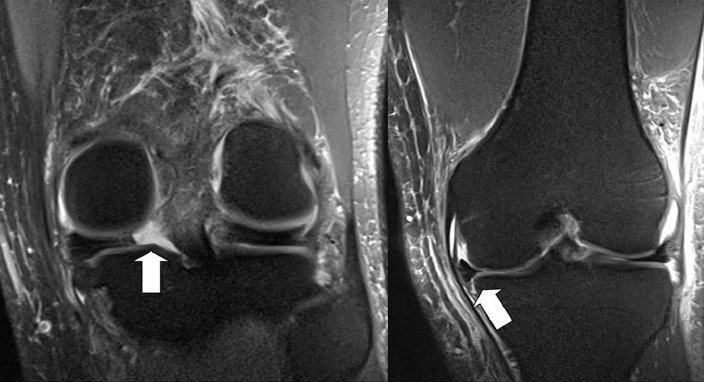 In most situations an ACL tear is seen very precisely on MRI; however there are exceptions. In some cases the ligament is not torn, but just overstretched and has becoming too long. This can be difficult to see on an MRI, but a clinical examination will in most situations reveal this. If you already have had an ACL reconstruction and your knee has become loose again, this can be difficult to see on an MRI, since the ACL graft will in most situations not become torn, but just slowly gets longer and longer. MRI scan can be very clear on large cartilage lesions, however smaller lesions can be difficult to detect and in those situations is the arthroscopy much more precise. 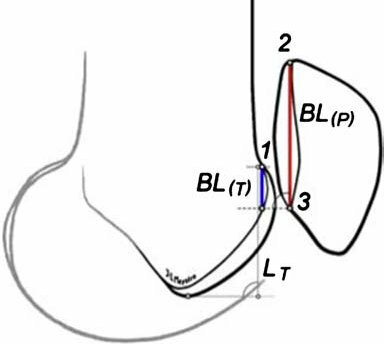 Here you see a lateral trochlear inclination angle at 7 degrees, which is a little below 11 degrees that is the threshold for calling it trochlear dysplasia. The normal angle is 21 degrees. It is important that the measurement of the inclination angle is done at the most proximal axial view, where both of the posterior femur condyles are seen. The lateral trochlear inclination angle varies substantially from the top of the groove (caudal) to the bottom (distal). The patellotrochlear index is a more clinically relevant measurement of patellar height than other types of measurements. 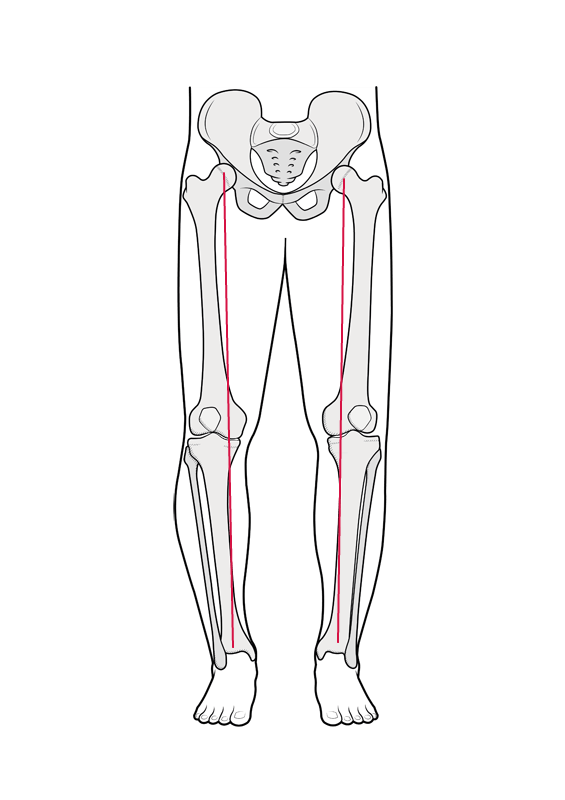 It is a measurement that says how big is the overlap between the trochlear groove and the kneecap. This is the only correct way to measure the height of the kneecap, and old measurements like the Insall-Salvati and Caton-Dechamp indexes are obsolete and imprecise. Those measurements do not say anything about the articulation between the patella and trochlea, and that is what patella alta is all about. 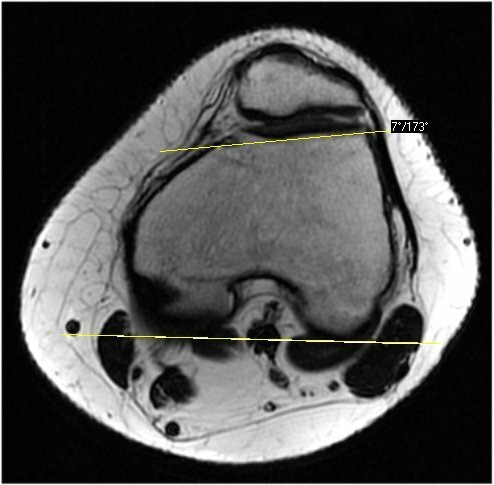 Above you see a figure that demonstrates a high-riding knee cap (patella alta) and you also see an arrow that points to a white area. The white area is increased water content in the fat pad and this means inflammation. 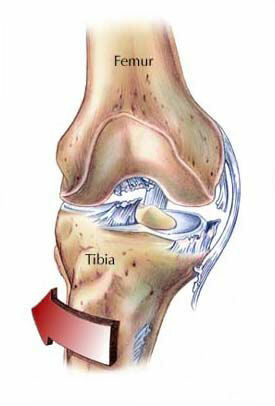 The inflammation is caused by the late engagement of the patella in the trochlear groove. The patella will first engage into the trochlea area when the knee is flexed several degrees, and that causes too much load on the fat pad and this causes the inflammation. This procedure is indicated for chronic unstable ankle. Some people have ankle sprains now and then. When the ankle sprains a ligament on the outer site tears and this is painful and most frequently it is the anterior talofibulare ligament that tears (ATFL). The ankle will be weak and there will be a period ranging from days to month to recover - keeping you out from sporting activity. For some the ankle continues to be unstable and this is naturally very bothersome. Sometimes it is just recurrent sprains, and in other cases the ankle also feels unstable and wobbly, and in those cases stabilising surgery is indicated. A relatively new surgical technique has become widespread very fast, based on its simplicity, the lack of postoperative bracing and the fast recovery and good results. 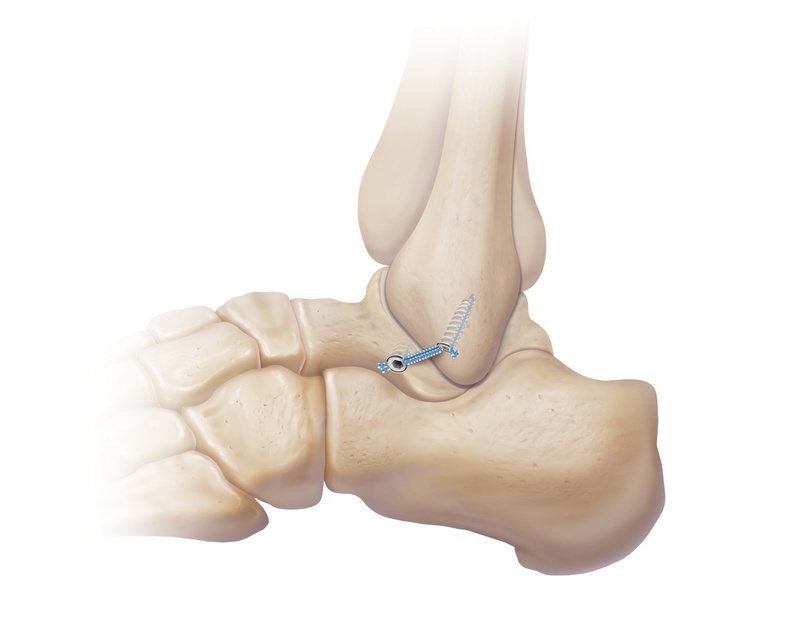 The surgery is based on the traditional Broström operation where the sprain ligament is tightened, but instead of placing the ankle in a brace an internal bracing is used - meaning it is tightened and reinforced by a synthetic ligament. Sometimes when the ankle sprains, the joint cartilage can get damaged. The symptoms for this is continuous pain​ and swelling and eventually locking. If this is the situation it will be a good idea to have an arthroscopy in combination with the ankle-stabilising surgery. 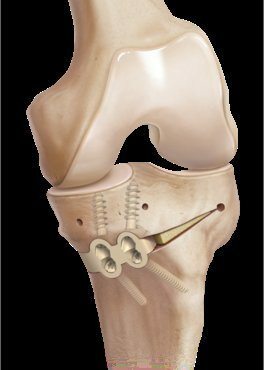 With the arthroscope the damaged cartilage can be identified and loose cartilage can be removed and eventually stimulation for repair of the lesion can be done (Microfracture also called Steadmann procedure). If your ankle is unstable it is very important to prevent further sprains by undergoing a physiotherapy-guided rehabilitation program. Afterwards you need to continue yourself with balancing exercises using a tilt or wobble board. Professor Gordon Mackay has developed and popularised this procedure, especially in the ankle. 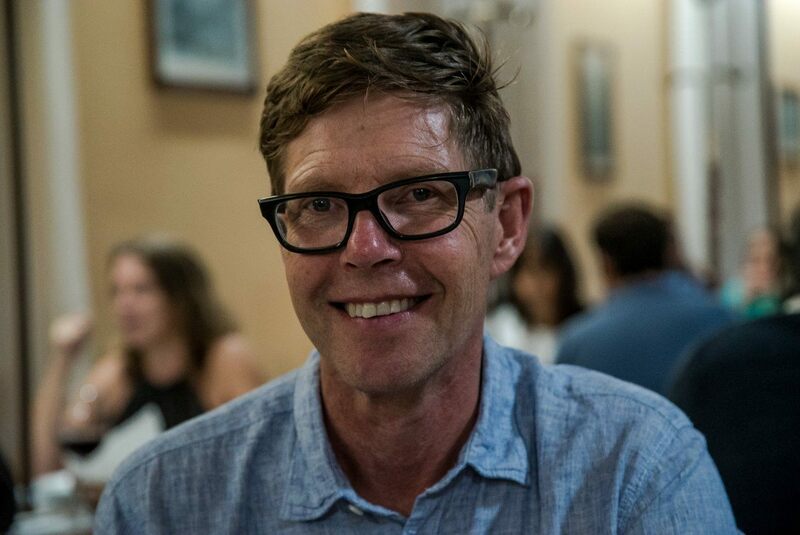 Professor Adrian Wilson has also pioneered the use of internal braces in different knee ligaments with the synthetic graft (Fibertape, Arthrex). 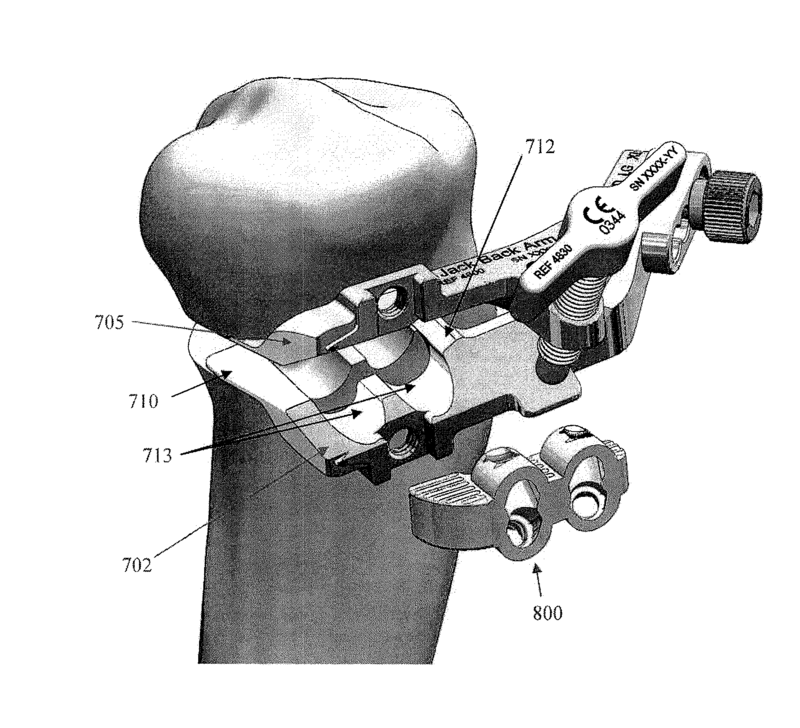 The shoulder joint includes a socket and where the head from the upper arm is running. Around the socket, is a labrum, and this labrum is a structure in between cartilage and ligaments. The labrum acts as a kind of seal, which makes the socket a little wider and is like a package that provides stability to the joint head. On the labrum inserts the long head of the biceps tendon. A pull or twist of the arm, can result in that the biceps pulls the labrum from the socket and this is called a SLAP tear or a labrum tear. See Figures 1 and 2. The typical symptoms are pain and clicking deep in the shoulder, or simply diffuse pain around the whole shoulder. 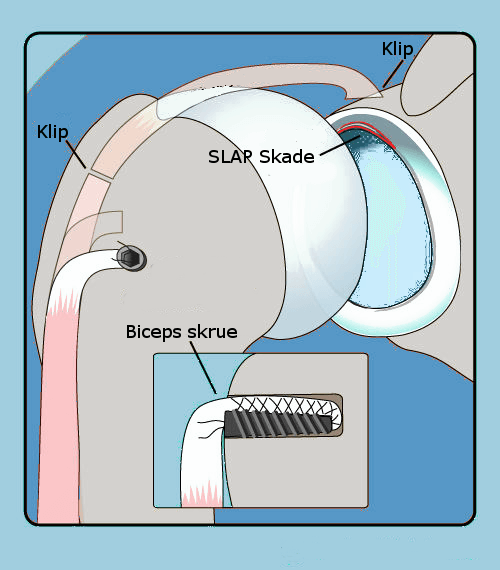 If you have been diagnosed with a SLAP lesion, an shoulder arthroscopy could be needed. The diagnosis can be very difficult to make as the injury frequently can be difficult to diagnose on MRI scans - even MRA (arthrography), but only determined by keyhole surgery. 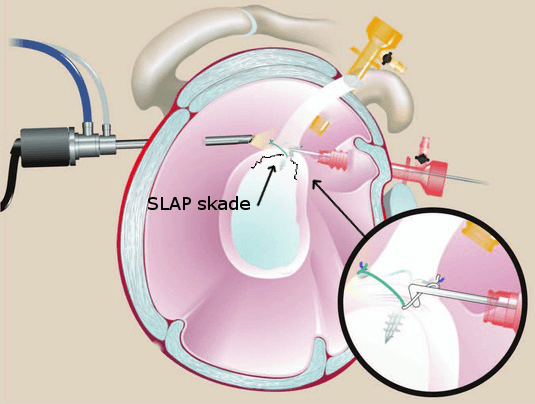 SLAP lesions may be operated in 3 different ways. SLAP re-fixation: The labrum is reinserted back by arthroscopic technique (typically for those under 30. The arm must after the surgery be kept in a sling for about 4 weeks) See Figure 1. Biceps tenodesis: The biceps tendon is released from the attachment on the labrum and reattached again at the top of the upper arm. When biceps no longer pulls in the labrum, the labrum will automatically heal back to the socket rim. (Typically for those over 30 years and the arm must be kept in a sling for about 4 weeks after surgery) See Figure 2. Biceps tenotomy: The biceps tendon is released from the attachment on the labrum, but unlike the Biceps Tenodesis (the method no. 2), the biceps tendon is not reattached. After the operation used a sling as pain management, but the arm must be well used. Biceps tenotomy: Typically, a technique used for those over 50 years. The downside is that some of the biceps muscle can end sitting a little lower on the upper arm, and thereby provide cosmetic nuisance. In addition, it can cause a 15% reduced force in the biceps muscle. The advantage is that after the surgery do not need to use an arm sling and have less pain after surgery and to recover so quickly. The WORC score is a condition-specific 21-item self-reporting questionnaire using a visual analogue scale. Here is the new updated version of the The Western Ontario Rotator Cuff Index also called WORC score . The WOSI questionnaire has been designed for self-assessment of shoulder function in patients with shoulder instability, and gives an assessment of its severity. This is the new updated version of the The Western Ontario Shoulder Instablity Index - also called WOSI score,. for a link to a dynamic online version of the WOSI Index where you can adjust the sliders online. A number of muscles of the scapula work in harmony to facilitate and allow full shoulder movement. Damage to the muscles or the nerves going to the muscles may result in abnormal movement of the scapula - called Scapula dyskinisis. These tests evaluate these muscles and also the ligaments of the AC (acromioclavicular) joint. Certain types of shoulder injury can be diagnosed by eliciting or 'provoking' pain only when the shoulder is in a certain position - these tests are called 'provocation tests'. The 'rotator cuff' is a group of tendons arising from muscles that go from scapula to humerus, and whose actions allow rotation and balancing of the shoulder. Together the tendons form a kind of 'cuff' around the upper end of the humerus.